It's Mardi Gras season, y'all! Crawfish Etoufee in celebration of the most festive time of the year (at my house). As a grandchild of New Orleans, it's my duty to share alllll of the recipes in my Creole arsenal with you. 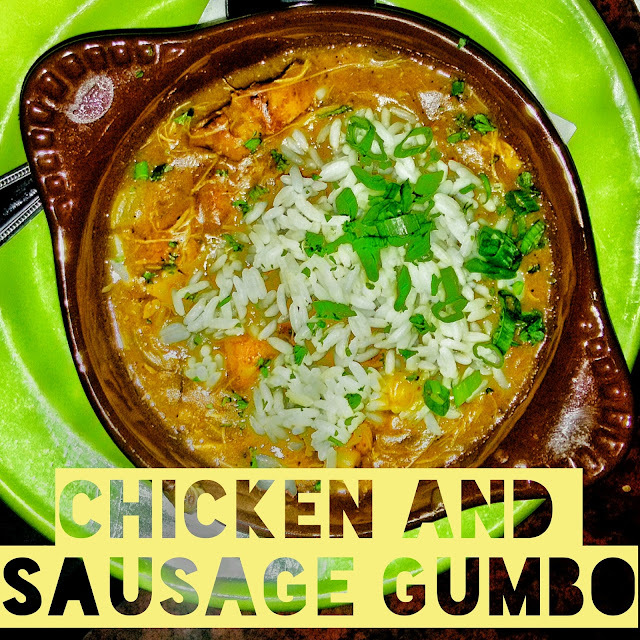 This time around, it's Chicken And Sausage Gumbo, one of two recipes I'm sharing this season. EITHER WAY... this recipe still has all of the usual suspects and a little surprise of simplicity. 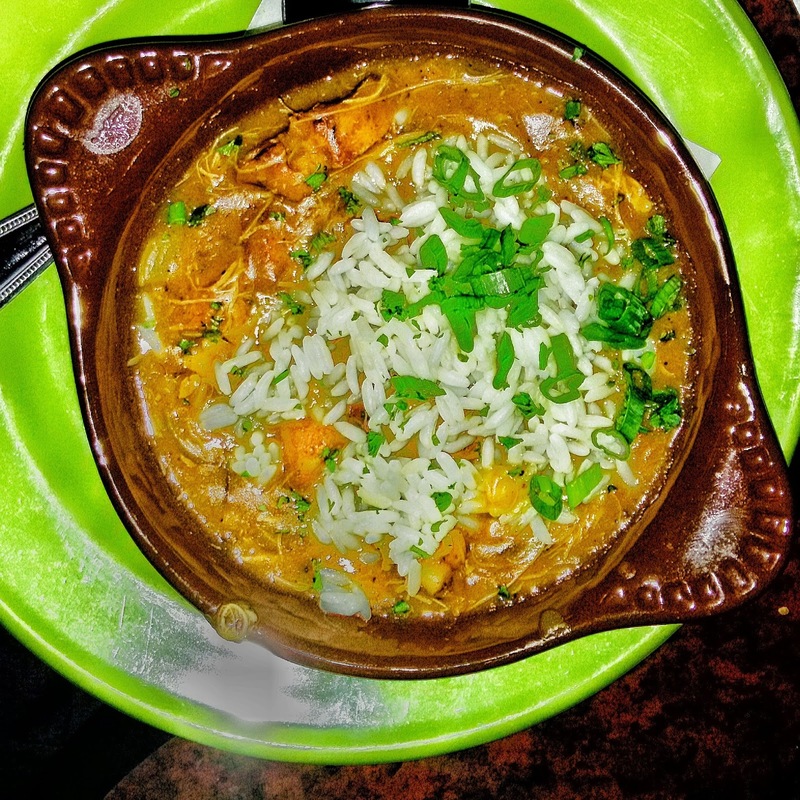 After you make the roux, it's smooth sailing from there on out. Add the vegetables, herbs and spices, meat and you'll be celebrating eating in no time at all. Heat oil over medium-high heat in a large stock pot. Whisk in flour and continue to stir constantly until roux turns a deep, dark chocolate brown (or another shade of your liking). This should take around 30 minutes. If you sense that your roux is in danger of burning, reduce heat immediately and continue to stir. Once roux has reached desired shade, carefully stir in onions, bell pepper, and celery, and continue to stir about 5 minutes, until vegetables begin to wilt. When the vegetables hit the roux, be careful of the cloud of steam. Add salt, cayenne, chicken, sausage and continue to cook about 5 minutes. Add bay leaves, thyme, stock and bring to a boil. Reduce heat and simmer, uncovered, for an hour, stirring occasionally to prevent burning. Skim off any fat that rises to the surface. Adjust seasoning. Thin out with more stock or water if necessary. Serve with/over white rice, if desired. I've never made gumbo before, but now I'm anxious to try your recipe. With or without okra - this gumbo looks fantastic! Honestly, I didn't know canned okra existed! I've never seen it. I think it's a safe bet to say it would be okay to use it. It would just be for flavor,I'd think. Yum ... sounds delicious. I have a colleague who makes gumbo once a year for our holiday potluck and it's always the first thing to go. So tasty!